We are the WriteGirl Summer Intern Team: Janel and Jacqueline, current WriteGirl mentees; Renae, Victoria, and Alejandra, WriteGirl alumnae; and brand new to the WriteGirl world: Sara, Melissa, Malika, and Sydney. Victoria: I think you all would be lying if you said that you guys weren’t nervous the first day. Renae: I was really nervous my first day. Was anybody else nervous? Alejandra: When Tina (amazing WriteGirl staff member) came to get me at the gate, she was so friendly, which made me feel a lot more relaxed. It made me realize that the WriteGirl office was going to be full of cool people. Sydney: I was initially concerned that I would get lost trying to find the office because the complex is so big. I felt like I was playing an online maze game, but in a really trendy factory. 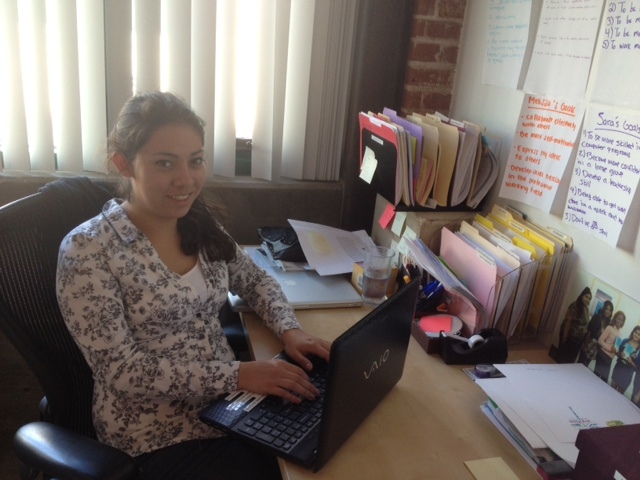 Janel: What I really love about the WriteGirl office is that it looks like a New York loft space! I love the exposed brick. Renae: And in the middle of the room, a huge table – every corner filled with people, books, and laptops. Melissa: On my first day, I just sat quietly working by myself and was nervous about making mistakes. Jacqueline: On the first day, I had to answer the office phone and I was so nervous that I sounded incomprehensible. That day, I nit-picked everything I did, from what I wore to how I spoke, giving myself side notes on how to improve. Victoria: My first lunch was pretty quiet as well, but it gradually got a little louder. I was unfamiliar with everyone but after working together for a few hours, I realized that we could actually talk about school and stuff. Jacqueline: That lunch was too awkward. It still makes me laugh to think about it. Melissa: Yeah, I started talking to the other interns throughout the day and it made me feel so much more comfortable. Janel: I realized that school is actually important! It was just mind-blowing to be able to see the application of everything that I’d learned in the classroom. All the research skills I gained from studying for history exams or trying to figure out biology homework, actually became useful in real-world situations when we were assigned to research girls’ education across the world. Jacqueline: I realized that being proactive is never a bad thing. Throwing out ideas and suggestions isn’t presumptuous, but shows that you are driven. As an intern I have been able to work on my communication skills, expanding them so that I’m vocal and professional. Sydney: Basically everything that I expected an office environment to be like is the opposite of how it is at WriteGirl (in the absolute best way possible). No one is hunched over their desk with blank, expressionless faces. Everything is open and communication isn’t merely encouraged, it’s required. Renae: I had to get out of my shell and talk to other people, I had to learn how to collaborate with everyone else since we’re all sitting together – it’s not like we can just ignore each other. Victoria: Everyone here is also able to catch on quickly. We are easily adaptable to different tasks, from answering phones to hosting events for 300 people. Malika: I was even more surprised about the casual attire, because I dressed more conservatively my first day. I felt so uncomfortable, but thankfully WriteGirl allows everyone to be who they are, so I ditched that outfit the next day. My individuality is appreciated. Malika: Since it’s pretty much always a big group of interns, at times we have to work independently and at other times, collaboratively, which were both my goals for this internship. Renae: I learned how to answer the phone professionally, and gained the ability to answer questions posed to me, or at least know who to pass the phone to. Sara: Even though I hate cleaning my room, I learned to organize things in such a way that it’s easy for everyone to find what they’re looking for. You should see the supply closet now! Malika: Calling companies to reconfirm their contact information was sometimes daunting because we were sometimes hung up on! But I learned it’s important to not take that personally. Sydney: I’ve learned a lot from all of the office work that I’ve done here, but I also love that writing is included in our daily regime. We start with a free-write every morning, which jogs my brain and keeps me engaged in other tasks. Janel: I loved working on the group monologue (written for the WriteGirl Season-End Event) because we got to work collaboratively with one another to create a presentation about girls’ education and empowerment, which we all feel strongly about, and ties back to WriteGirl’s mission. Jacqueline: In fact, the group monologue encouraged me to research more about girls’ education worldwide when I got home. It opened my eyes to how the world is a big place and I play a small but important part in it because I am an educated young woman who should use her voice to help other young women. Renae: As an alumna, getting to see the Season-End event from both sides was really interesting. As a mentee, I only saw the finished product, and never fathomed what it took to pull the whole thing off until I became a WriteGirl intern and had to work behind the scenes. Alejandra: I realized that all the things that WriteGirl provides: journals, snacks, and lunch at workshops, don’t just fall from the sky – someone had to make all the calls and solicit for donations. Melissa: I really look forward to more workshops with Liz Prescott (one of our dedicated volunteers), like the ones we had where we learned phone skills and how to network. At the networking workshop, I learned to keep my right hand free when I go out to any event, so I can easily shake hands when I meet new people. Malika: I want to learn how to work independently and have the skills necessary to get a job. I know that when I go to another job I can use everything I learned from this internship thanks to all the great mentoring from staff and volunteers. Sara: One thing I wanted to improve was my writing skills. We have short writing activities in the morning to get the juices flowing. 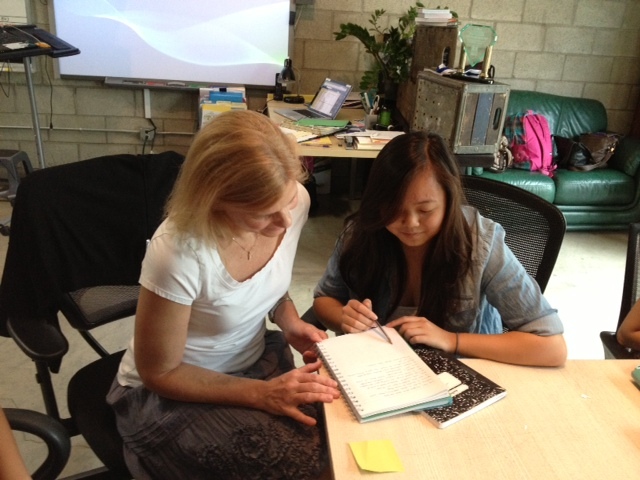 I’m thankful I’m in the WriteGirl office because anyone can help me with editing my work. Sydney: I’ve loved getting to know so many kind and talented women writers. WriteGirl gave me a sense of community from the first time I visited the office. Through this internship I’ve definitely gotten better at listening to others and learning about different life experiences.